Bhubaneshwar the capital of Orissa is a city of temples, several of which are important from an architectural standpoint. The Lingaraj temple - the largest of these is an outstanding specimen of the Orissa style of temple building. It is about a thousand years old. 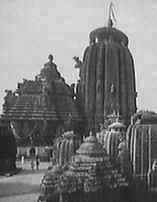 Bhubaneshwar, Konarak and Puri constitute the Golden triangle of Orissa, visited in large numbers by pilgrims and tourists. Bhubaneshwar is also a revered pilgrimage center, referred to in the Bhrama Purana. The Bhrama Purana refers to Bhubaneshwar as the Ekamra Kshetra enshrining a crore Shiva Lingas. The Lingaraja temple is said to have been built first by the ruler Yayati Kesari in the 7th century who shifted his capital from Jaipur to Bhubaneshwar. Bhubaneshwar remained as the Kesari capital, till Nripati Kesari founded Cuttck in the 10th century. Inscriptions from the period of the Kalinga King Anangabhima III from the 13th century are seen here. Structurally, the Parasurameswara temple at Bhubaneshwar is the oldest, dating back to the middle of the 8th century, and the Lingaraja is temple is assigned to the 10th century. The nata mandir and the bhog mandir of the Lingaraja temple are of later origin. Legend has it that Shiva revealed to Parvati that Bhubaneshwar - or Ekamra thirtha was a resort favoured by him over Benares. Parvati in the guise of a cowherd woman, decided to look at the city herself. Two demons Kritti and Vasa desired to marry her. She requested them to carry her upon their shoulders, and crushed them under her weight. Shiva, then created the Bindu Saras lake to quench her thirt, and took abode here as Krittivasas or Lingaraja. The Temple: The vast Bindu Sagar lake is the center around which are located the multitude of temples of Bhubaneshwar. The Lingaraja temple is located in a spacious courtyard covering over 250000 sq feet and is bounded by fortified walls. Its tower rises up to 180 feet and is elaborately carved. The Shivalingam in the sanctum of the Lingaraja temple rises to a height of 8 inches above the floor level, and is 8 feet in diameter. The Bhagawati temple is located in the northwest corner of the courtyard. There are several other shrines and temples in this vast courtyard. Worship: A total of 22 worship services are offered each day. Once a year, an image of Lingaraja is taken to the Jalamandir in the center of the Bindu Sagar lake. Other temples in Bhubaneshwar are the Ananta Vasudeva, RajaRani, Mukteswara, Kedareswara, Siddheswara, Parasurameswara.